A year after dropping Crazy, the girls of 4Minute are back with Act. 7, helmed by a title track that continues their venture into trap music. Gayoon has once again taken charge of the styling for this mini-album, drawing from hip-hop fashion, like she did for Crazy. I’m not familiar enough with hip-hop to comment on this from a socio-cultural standpoint, but from an aesthetic standpoint, the main colours used are visually and symbolically effective. The songs play up different meanings that red, white, and black are associated with. Through its spirited rejection of an ex-lover, “Hate” brings out the emotional intensity and warning effect that red produces. “Canvas” evokes a different emotion associated with red—passion. Because of the innocence that it connotes, whiteness hints at emotional vulnerability, which comes through in “No Love”, “Blind”, and parts of “Hate”. The sense of power symbolised by black runs throughout the mini-album; regardless of the emotions expressed, the personae are in control, whether in initiating break-ups or taking their relationship a step further. The build-up from introduction to the chorus has incredible layering and momentum. Responses to the chorus itself, however, could go two ways. A quick check with a friend who is familiar with Indian classical music, coupled with some online research, confirmed that the motif here bears a lot of resemblance to the Carnatic singing scale. I’m not sure what to make of this, as there isn’t enough information on the composers’ intent to explore cultural implications. Musically, the motif is memorable, the lyrics are simple and repeated, and the syncopation is addictive, making the chorus good to jam and sing along to. On the flip side, although a common beat underlies most of the song, the chorus still sounds significantly different compared to the verses, a contrast which may not sit well with some listeners. Hyuna’s and Jiyoon’s rapping tend to be more expressive when their voices aren’t strained. The heartfelt sentiments captured so beautifully by the verses risk being reduced to a caricature by the pinched quality of the raps in the chorus. The syncopated music also competes in volume with the rapping. Nonetheless, if the song is going in for an element of surprise, the chorus achieves it. The contrast in tones also captures the ricocheting of emotions following a breakup. “No Love” signals a narrative progression: from the defiant declarations in the breakup anthem that is “Hate”, “No Love” moves into a more pensive mood tinged with regret. 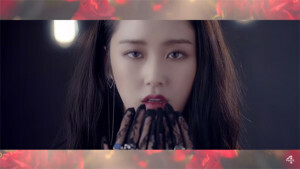 The lyrics of “Blind” are penned by Sohyun, and describe the persona’s feelings towards a lover who hid his true feelings and pretended to like her; she laments that she was blind for not seeing how he had tricked her. “Blind” is another track with an interesting use of the synthesiser. The twinkly synth has a tempo and rhythm that is similar to the beats in house music, but it has the dreamy effect of trance. The synth is set off against the harsher tones of the raps and the expressiveness of R&B singing. Her voice is electronically altered, but the subtlety of the altering and the layering of harmonisation work together to create a compelling, haunting effect. The style of the chorus reminds me vaguely of Lana Del Rey: it contrasts Hyuna’s apathetic drawl with Gayoon’s plaintive, drawn-out notes. A warped synth brings the song to an abrupt close, like a relationship ending on a sour note. The red-on-white contrast reminds me of Isak Dinesin’s short story, “A Blank Page”, which describes a royal custom of displaying a white sheet stained with the princess’s blood the morning after her marriage and proclaiming her to have been a virgin. 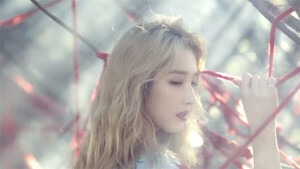 The beats in the chorus are kept simple, with only key notes in the chord emerging to support Gayoon’s melody. In the second part of the chorus, with alternating lines from Gayoon and Jihyun, there is a motif that, again, seems to have an element of Indian music in it. It’s catchy, but it sticks out in an otherwise very cohesive piece. As a whole, Act. 7 is incredibly tight-knit, both lyrically and aurally. It only has four tracks, but none of the songs are generic. Each song has character and is experimental in its own way, while still making for easy listening. The three filler tracks provide a refreshing counterpoint to the title track, proving that with a good beat, a song doesn’t necessarily need to be loud and fast to be musically arresting. The members got to shine in their own ways in the production of the mini-album. Jihyun finally secures a good share of lines, and she delivers, especially in “Hate” and “Blind”. Gayoon continues pursuing her interest in styling and stuns with her introduction in “Hate”. Although Sohyun has considerably fewer lines, she showcases her effort in taking full responsibility for writing the lyrics to “Blind”, and Hyuna and Jiyoon stand out in their more subdued rap verses. As 4Minute’s contract expiry date draws near, it is unclear what the future holds for the girls. Nevertheless, Act. 7 allows us to appreciate, more than ever, the group’s versatility and how they continue to bring fresh sounds while staying true to their niche area of dance music.